On the other hand, leaving your cash in a savings account isn't going to get you ahead of the game. In order to be successful financially, you will eventually have to face some risk. In fact, being too complacent with your cash can be one of the biggest financial risks of all. Do you feel like your current location is lacking in career opportunities? Or perhaps rent is atrocious and you're finding it hard to get by? A move may be a solution. There's no doubt about it — moving is expensive. You may have to break a lease and sign a new one, complete with security deposit. You'll probably have to pay for a moving truck, movers, new furniture, and more. Not to mention, your new city could come with a much higher cost of living. But, for some people, moving could be well worth it. Graduate school is a big investment, so it's important to weigh whether or not the expense is worth it in the long run. Tuition costs are ever increasing, books are expensive, and if you choose a full-time program, you are losing out on income you could have earned while working instead. Starting a business is outside many people's comfort zone. It can cost significant cash to start and to grow a business from scratch. There is also uncertainty in working for yourself if you've only ever worked with for a traditional 9-to-5 employer. The stock markets are full of ups and downs and uncertainty, but the payoff can be huge. Most, if not all, experts would agree that failing to invest is riskier than not investing. While leaving your money in a savings account might ensure it doesn't lose much value in the short term, it won't gain much value, either. In fact, due to inflation, you are likely to lose value over time. The housing market isn't necessarily as stable as it used to be, and a home is a major cost. 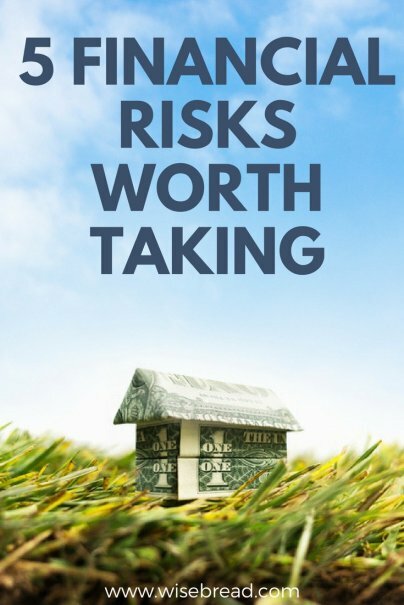 But can it be worth the risk?